All participants on the course must have a race bib visible on the front of their body at all times. No bikes, scooters, skates or skateboards will be allowed on the course. Bring the whole family and don't forget to take a photo with Stomper the Oakland A’s mascot and Uncle Sam! There will be 2 water stops/aid stations on the course (at miles 1 and 2) and a ton of delicious and refreshing post-race goodies and bottled water. The Concord-Diablo Rotary Club will have a pancake breakfast available for $5 from 7:30 am until 11:00 am. 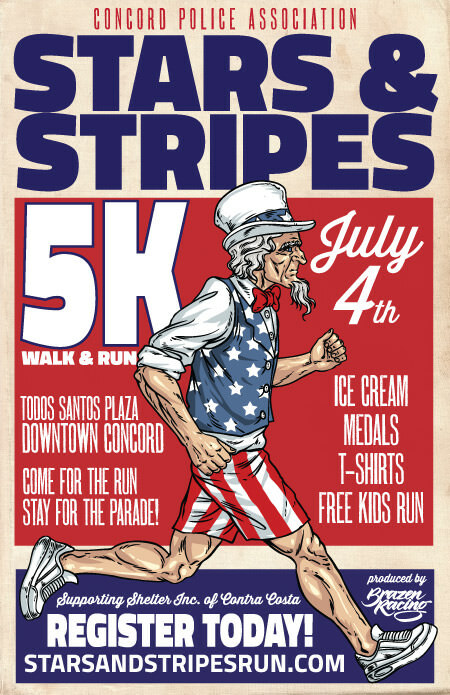 After the race, stay for Concord’s famous and fantastic 4th of July Parade (starting at 10:00 am), complete with floats, bands, equestrian & dance teams and more! 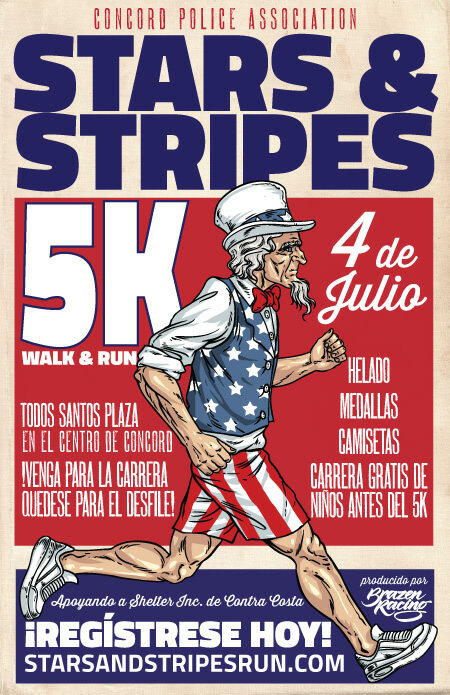 Help make this 4th of July running party even better by inviting your friends, family and neighbors. You can share these images online or click on them for a printable version that you can post wherever you like! 6:30 am–7:30 am: Late 5K bib pick-up. Registration (if not sold out before race day). 6:30 am–7:30am: Kids Fun Run sign-up available. Free for kids ages 10 and under, parents just sign a waiver on race morning. 8:00 am: Kids Fun Run with Stomper! START YOUR 4TH OF JULY IN STYLE!